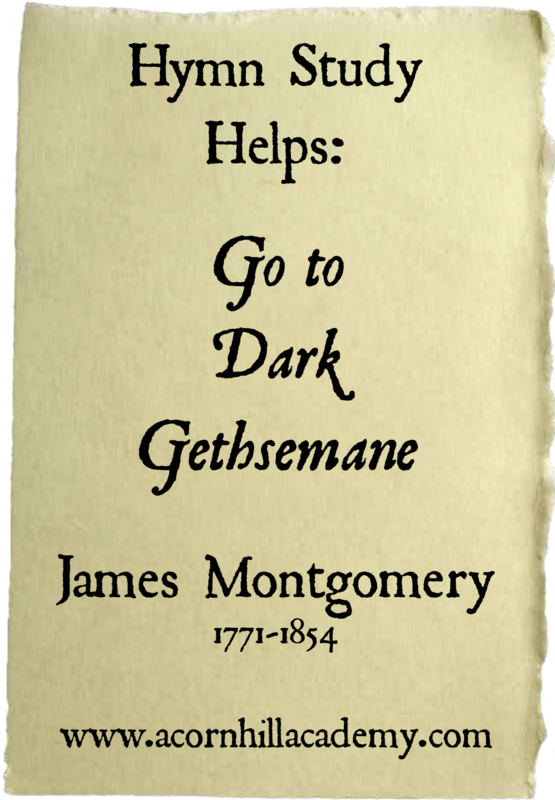 In our little Charlotte Mason co-op, we are currently studying the hymn, "Go to Dark Gethsemane" by James Montgomery. It is a beautiful hymn, and I don't remember singing it before Sara introduced us to it. I've found myself connecting with hymns as never before, and this one has touched my heart particularly this last week, as we've walked with Christ during the Holy Week readings at our church. As I've been singing this with my children, I see Christ so vividly, praying not to have to be crucified, and yet going willingly because He knew it had to be. I am so grateful for His sacrifice for me, and this hymn reminds me so beautifully to turn to Him when things seem too hard. The petty struggles of my day-to-day life come sharply into focus in proper perspective when I consider what He has done. I hope this hymn will bless your Good Friday meditations. Click here for a PDF of music with lyrics. Beautiful! I have never heard this hymn before. I would love to here it, I'll have to go check YouTube. I love how this hymn points out that Jesus is who we need to be looking for for wisdom on how to pray, live, bear our crosses and die to self.